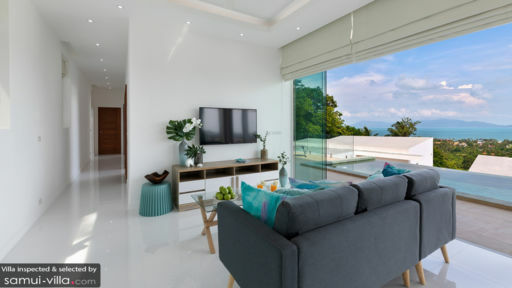 Found in the famous Bophut region in Samui, Villa Blue Munii is an ocean-facing modern home that features elegant design, western interiors, and a view that is so enviable you would hate to leave. From the natural environment to the man-made house, everything is classic, luxurious, and comfortable. There are three bedrooms for six guests, a dining and living area, a private infinity pool with poolside sala, and plenty of room to enjoy the breathtaking sights out front. 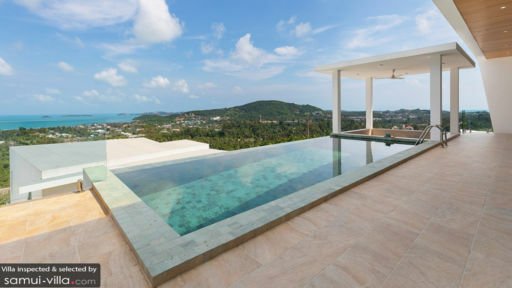 Enjoy a fun-packed and yet easy-going holiday with loved ones while relishing the panoramic beauty of Koh Samui. The three air-conditioned, beautifully-designed bedrooms at Villa Blue Munii are accessible from the pool deck directly through sliding glass doors. The beautiful blue shades remind you of the ocean and the tropical skies while you’re resting on comfortable double or single beds. The bedroom décor is kept to a minimum for a soothing ambiance. Each bedroom comes with its own en-suite bathroom that is fitted with freestanding bathtubs and/or walk-in showers. The beautiful outdoors at Villa Blue Munni are accented by the pervasive presence of a blue, blue ocean in the distance. Framed lusciously by tropical flora and clear-blue skies, this glorious view is nothing short of a John Constable painting. If you’re an art lover and a nature lover, you will surely love this side of the villa. The infinity swimming pool is the ideal place for lounging about and idling away under the tropical sun or you can head to the poolside sunken terrace with comfortable sitting and a bird’s eye-view of the panorama. There are sun chairs perfect for a sunbath or a nap. Right off the swimming pool is the pristine white living room at Villa Blue Munii adjoined directly by sliding glass doors that also allow a gorgeous view even when you’re indoors. The whitewashed walls and ceiling all create a larger space for guests as well as a cool and calming ambiance to rest in. The living area has been furnished comfortably with a sectional sofa, flat-screen TV, air-conditioning, ceiling fan, DVD player, etc. to ensure you have a space that you can retreat to after a long day. When you’re feeling peckish, make your way to the villa’s adorable six-seater dining table found in the living area where you can dig into a divine feast prepared by professional staff upon request. If you’re open to cooking, the villa’s fully-equipped western kitchen is the perfect outlet for your skills. With modern appliances and amenities, there’s nothing you don’t have access to here. The villa provided housekeeping service once a week. However, the villa staff is open to giving you recommendations and also make arrangements for transportation, private chef, massages, etc. upon request as these come at an additional charge. 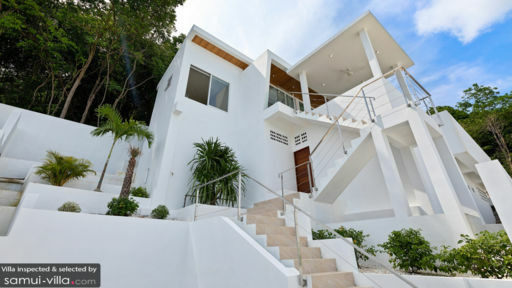 Found in Bophut Hills, the villa is ideally located surrounded by rainforests and overlooking the ocean. This beautiful vista is made even better owing to the nearby markets, restaurants, and family-friendly beaches. Choeng Mon beach, Fisherman’s Village Bophut, and Bophut beach are all nearby for your convenience.